Of these, the most common are electrical problems. Flickering LED lights, problems with the refrigerator or electric brake actuator (if your trailer has disc brakes), short battery life, and dim lights can all be symptoms of one common problem: bad electrical grounds. In 12 volt DC wiring systems, every device (light, water pump, fan, furnace, etc.) has a 12v+ (positive) and 12v- (negative) connection. The negative connection goes to “ground” (or “earth”) in British English) to complete the circuit. Generally, all of the ground connections in a travel trailer or car end up being attached to the metal frame of the vehicle. When the ground connectors get corroded or loose, all kinds of strange problems can occur. Electricity wants to find a path, so if the ground is poor, the current may run in unexpected ways, even backwards through a circuit. This can cause appliances to fail, work incorrectly, or intermittently. Late model Airstreams usually have one or two external grounding points that provide the main electrical path to the frame. On vintage Airstreams the ground may be inside. Once located, these grounds can be easily checked. On a late model Airstream one is usually toward the front, possibly beneath the A-frame where the propane tanks sit. Look for a thick bare copper wire that is bolted to the frame or to a propane gas line with a small copper clamp. The location may vary—on some trailers it is located near the front curbside stabilizer jack. If this wire looks corroded or exceptionally dirty, unscrew the clamp that holds it in place and clean up the clamp and wire with sandpaper or wire brush. The copper should be shiny where the wire makes contact with the clamp, for a good electrical connection. Don’t paint it! 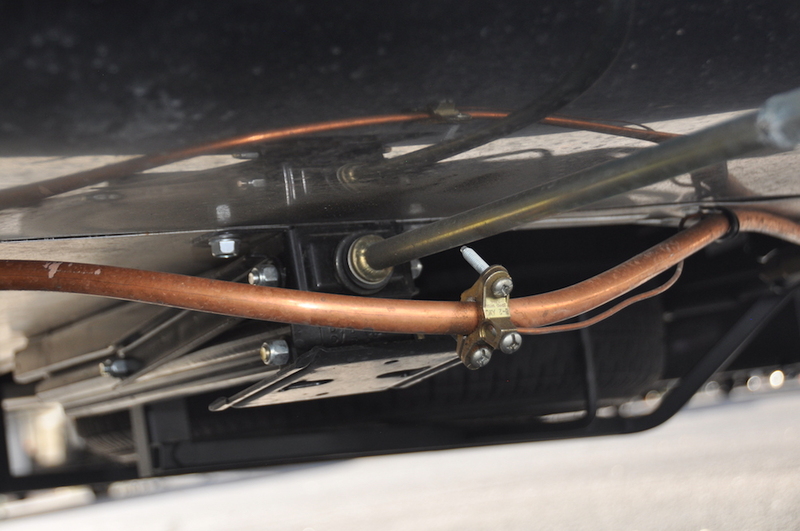 There may be a second ground wire located inside the rear bumper compartment, which can be serviced in the same way. After cleaning, you can coat the area with dielectric grease (or pure silicone grease) to reduce future corrosion. Checking the grounds is not just a good diagnostic step, it’s good maintenance that might help you avoid mysterious electrical symptoms later. Since it’s easy to do with just a screwdriver and sandpaper, considering doing this procedure once a year.